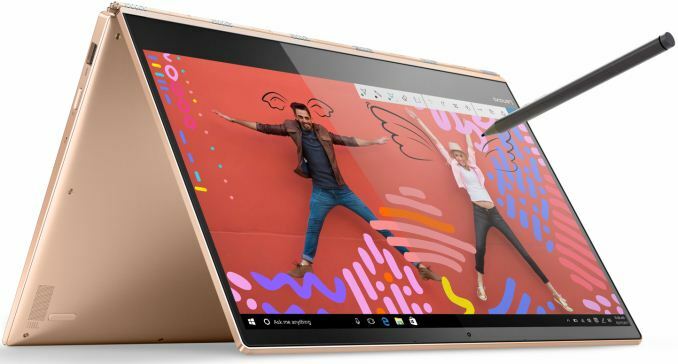 Lenovo this week announced its new Yoga 920 convertible laptop that became more powerful due to Intel’s upcoming 8th generation Core i-series CPUs with up to four cores, better connected thanks to two Thunderbolt 3 ports, yet slimmer than its predecessor. The new model inherits most of the peculiarities of the previous-generation Lenovo Yoga 900-series notebooks and improves them in various ways. 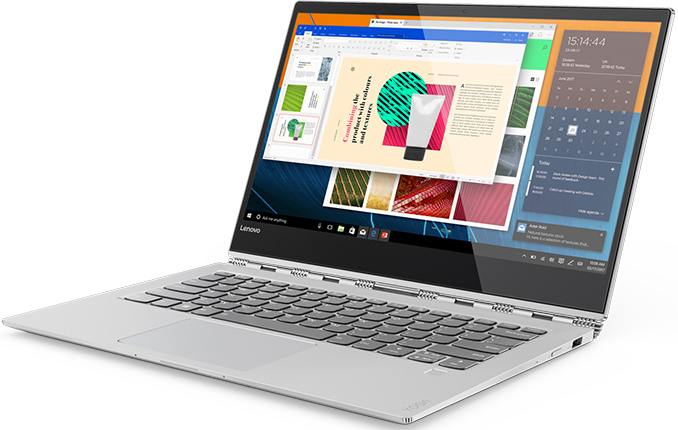 The new Lenovo Yoga 920 is the direct successor of the Yoga 2/3 Pro, Yoga 900 and the Yoga 910 convertible laptops that Lenovo launched in 2013 – 2016. These machines are aimed at creative professionals, who need high performance, 360° watchband hinge, touchscreen, reduced weight and a long battery life. Over the years, Lenovo has changed specs and design of its hybrid Yoga-series laptops quite significantly from generation to generation in a bid to improve the machines. This time the changes are not drastic, but still rather significant both inside and outside. The new Lenovo Yoga 920 will come with a 13.9” IPS display panel featuring very thin bezels and either 4K (3840×2160) or FHD (1920×1080) resolution, which is exactly the same panel options that are available for the Yoga 910. In the meantime, Lenovo moved the webcam from the bottom of the display bezel to its top. Besides, it reshaped the chassis slightly and sharpened its edges, making the Yoga 920 resemble Microsoft’s Surface Book. 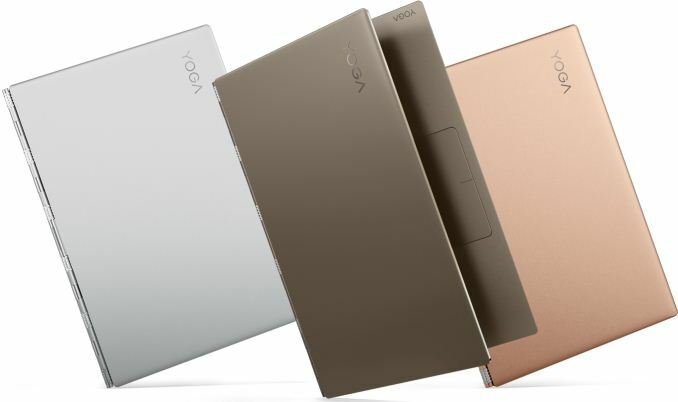 Changes in external and external design of the new Yoga vs. the predecessor enabled Lenovo to slightly reduce thickness of the PC from 14.3 to 13.95 mm (0.55”) and cut its weight from 1.38 kilograms to 1.37 kilograms (3.02 lbs). Internal differences between the Yoga 920 and the Yoga 910 seem to be no less significant than their external designs. In addition to the new Core i 8000-series CPU (presumably a U-series SoC with up to four cores and the HD Graphics 620 iGPU), the Yoga 920 also got a new motherboard that has a different layout and feature set. The new mainboard has two Thunderbolt 3 ports (instead of two USB 2.0/3.0 Type-C headers on the model 910) for charging, connecting displays/peripherals and other things. In addition, the new mobo moves the 3.5-mm TRRS Dolby Atmos-enabled audio connector to the left side of the laptop. Speaking of audio capabilities, it is necessary to note that the Yoga 920 is equipped with two speakers co-designed with JBL as well as with far field microphones that can activate Microsoft’s Cortana from four meters away (13 feet). 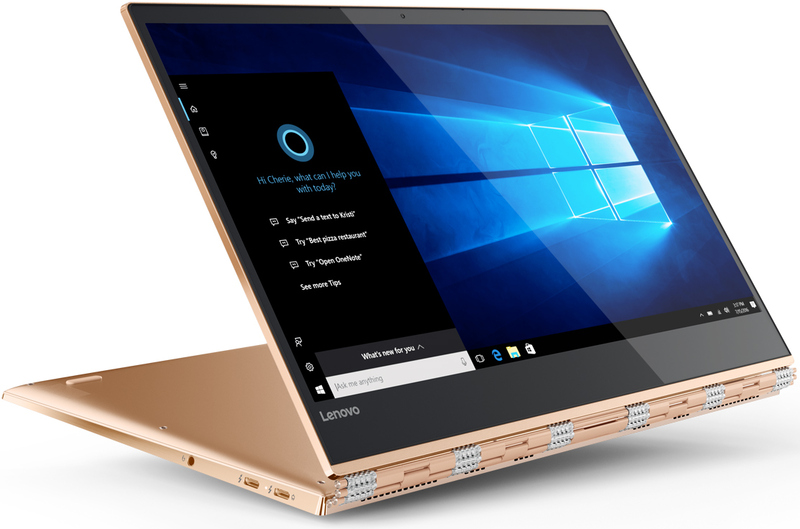 As for other specifications, expect the Yoga 920 to be similar to its predecessor: up to 16 GB of RAM (expect a speed bump), a PCIe SSD (with up to 1 TB capacity), a 802.11ac Wi-Fi + Bluetooth 4.1 module, a webcam, as well as a end-to-end encrypted Synaptics fingerprint reader with Quantum Matcher compatible with Windows Hello. The slightly thinner and lighter chassis as well as different internal components made Lenovo to reduce capacity of Yoga 920’s battery to 66 Wh from 79 Wh, according to TechRadar. 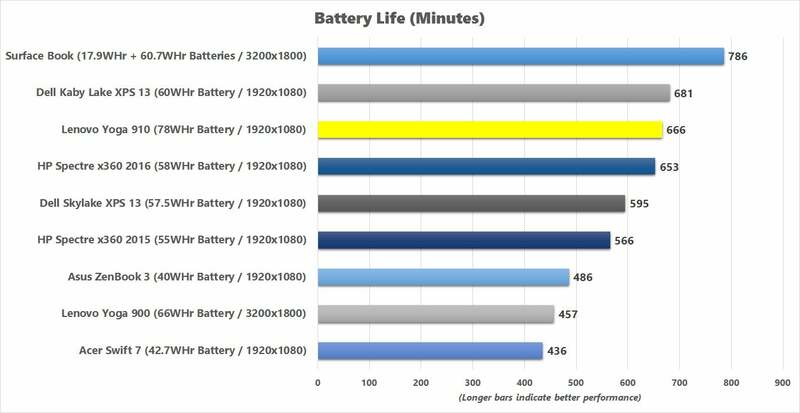 When it comes to battery life, LaptopMag reports that it will remain on the same level with the previous model: 10.8 hours on one charge for the UHD model and up to 15.5 hours for the FHD SKU. Dimensions 12.75" x 8.86" x 0.59"
Lenovo will offer an optional Lenovo Active Pen 2 with 4,096 levels of pen sensitivity with its Yoga 920. The stylus will cost $53 and will enable people to draw or write on the touchscreen. The Lenovo Yoga 920 convertible laptops will be available in silver, bronze and copper colors later this year starting from $1329 (a slight price bump over the predecessor). By contrast, the Yoga 910 came in silver, gold and dark grey (which the manufacturer called gunmetal). Really, Lenovo? You had to shrink the battery? After most people complimented the 910 had actually pretty good battery life or at least average? The issue is that Lenovo is inefficient; they hardly optimize the battery life, so they need much larger batteries to compensate for their laziness. With 78Whr, the 910 was lasting as long as laptops with 56WHr batteries (touchscreen 1080p, 15W U-series, 13", single DIMM RAM, and an SSD--so should be damned close). :( Lenovo doesn't understand how to optimize for power, so they drain like no tomorrow. 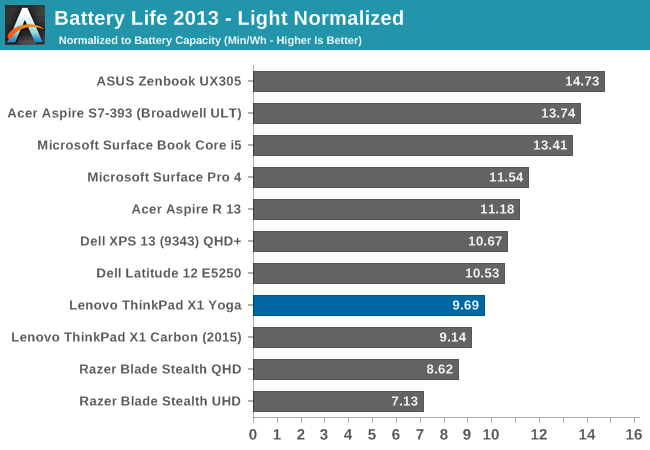 The efficiency of the X1 Yoga? Closer to the Razer Stealth UHD and QHD than any other Ultrabooks. Pathetic. "I don't think a quad-core chip (i.e., seems more likely to use more of its 15W budget than the dual-core 15W chips) is going to be helping any"
Using the yoga 720 for a few months, it is a very versatile device, and even thou far from cheap, it is actually a good value - quad core, a dedicated gtx 1050, 16 gigs of ram, pretty good stylus and decent battery life makes it quite usable. I'd actually give it the edge over this one, even thou it is like 600 grams heavier, that weight is put into a bigger display and tremendously better graphics. 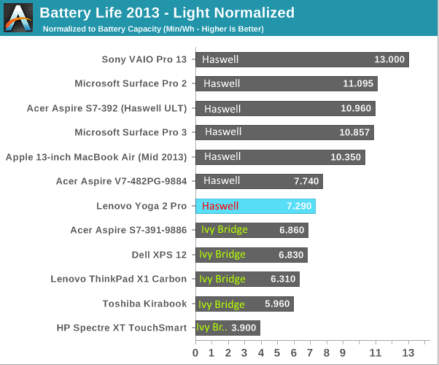 I don't think moving to an 8th generation CPU will make tangible difference in terms of performance or battery life. What I really love about it is that it is trivial to open, I've already replaced the TIM of mine, significantly improving thermals and as a result getting better performance because of less throttling. Half of the ram is unfortunately soldered on, but there is also an expansion slot, and you can even boost memory to 24 gb rather than the claimed maximum of 16, if you don't mind settling for asynchronous operation. Additionally, a cooler operating device will generally last longer before an non-repairable malfunction occurs. So, Lenovo, if you are reading this, a few cents spent on good TIM actually make your device about 10% better. It is well worth it. Don't be mediocre just because that's the industry standard. Replacing TIM definitely reduce fan's workloads as I've achieved on my 3 years old laptop. sonny73n: Battery technology improves at the rate of any other non-chip technology. Chip technology improved at the rate of Moore's Law.